One of the greatest challenges of climate change is communication. How do we communicate the impacts of climate change? How can we make people recognize the severity of the situation? How can we present solutions is a positive light? How can we help people understand the complexities of the climate debate? While there is no one way to accomplish all of these goals, I experienced one creative approach this week- the intersection of climate and theatre. Theatre@Emory performed a series of short plays relating to climate change and its solutions as part ofthe worldwide initiative Climate Change Theatre Action, a collaboration between the Center for Sustainable Practice in the Arts, NoPassport Theatre Alliance, The Arctic Cycle, Theatre Without Borders, and York University. Assume your audience knows as much as you do. Assume they are as concerned as you are. But they may not know what to do with this information and those concerns. So how can we turn the challenges of climate change into opportunities? 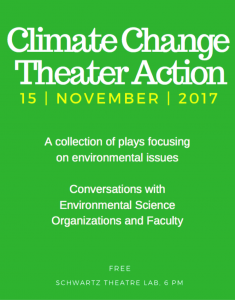 What I found particularly interesting about the performances and how they related to this theme, was how they wove the ideas of climate change into each of the plays. None of them outwardly mentioned the issue, but because we were an interested and concerned audience we were able to follow the message of these plays. It would be interesting to see how a less interested or concerned audience would respond to plays such as these. Overall, the plays were powerfully done, very engaging, and effectively drew you into the story. The first play—Blue Puzzle by Clare Duffy, featuring Julia Byrne—really spoke to the condition of the world today, especially describing how the world is filled with so much me and not enough us. This was shown through the eyes of a mother trying to provide for her child, while grappling with the change occurring around her. The play ended with the powerful message that change is inevitable, but we can use this change to our advantage to save the planet and ourselves. Another play titled Rubik’s Cube Solution—written by Sarena Parmar, and featuring Angela Jiang, Eliza Paprin, Colleen Carroll and Elizabeth Johnson—compared the problem of climate change to solving a Rubik’s Cube. This challenge was literally thrown at the characters in the play by a nameless, authoritarian figure who continued to discourage them throughout the play, and who represented all of the challenges that are posed to the climate change debate. This play presented climate change as an unsolvable problem that they were running out of time to solve; however, by working together and using each of their collective strengths, the characters end up finding a possible creative solution to the cube. The last play—Gaia by Hiro Kanazawa, featuring Victoria Hood, Julia Byrne, and Joel Hines—was a very powerful piece and was wonderfully staged to take place outside instead of in the theatre, which added to the connection with the Earth that the play was trying to convey. It started off with a more negative and downward turning feel, highlighting the threats and challenges posed to nature (especially those by humans), but as the play went on a shift occurred in the positive direction and the play ended in an uplifting and positive manner about how problems could be remedied. Overall, these performances were a creative way to approach the issue of climate change and present possible solutions in a unique and unexpected way, one that hopefully a wider audience may be able to appreciate and respond to.